The most delicious sweet chilli sauce from Thailand. 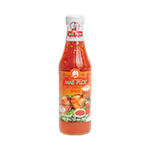 Maeploy is the true original brand known to all Thai people and offered in corner stores and sidewalk chefs throughout the country. Can be used with all meats or vegetables. Product of Thailand.